There are many reasons why teeth become stained or discolored over time, including tobacco use, and consuming highly-pigmented food and drink, such as red wine, coffee, tea, and cola. The natural aging process and even prescription medication use can also cause yellowing and graying of teeth enamel. Dr. Titi Dang, DMD of Pearly White Dental knows how important it is for her patients to have a beautiful, bright smile they can be proud of. 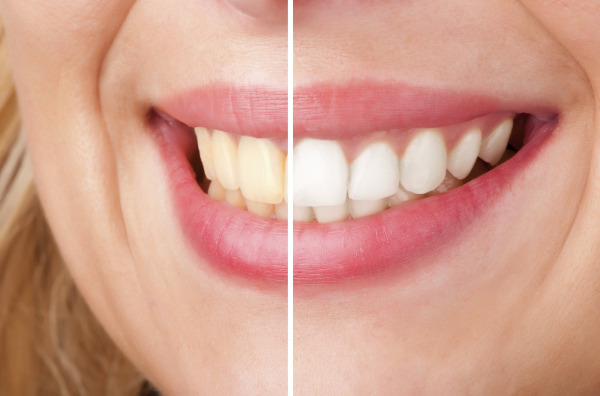 If your smile, and your self-esteem, has been negatively impacted by yellowed teeth, Dr. Dang offers teeth whitening in Huntington Beach, including quick and effective in-office teeth whitening treatment for a dramatically improved smile, in as little as one office visit. Professional teeth whitening from our Huntington Beach dental office is perfect for people who want quick teeth whitening treatment, so they can leave with a new smile that same day. Complete teeth whitening treatment requires only one office visit to Pearly White Dental. Many patients see their smile improve by up to 8 shades after their in-office teeth whitening session. Our teeth whitening systems combines advances in dental technology with proven active ingredient formulas that ensure your teeth bleaching experience is comfortable, and that the results are almost instant. • Paints a layer of the whitening gel on your teeth – Your gums are protected and will not be affected by this treatment. You will also be given eye and clothing protection, to ensure your comfort and safety during treatment. • Can Use Light to Active the Gel – Depending on the patient's sensitivity. • Repeats the above process in a few 15-minute cycles – The gel will be allowed to remain on your teeth for about 15 minutes, after which time Dr. Dang will remove the gel and the light and apply a second round. This process will repeat a few times, to help lift deep stains on teeth. The entire process for receiving teeth whitening from our Huntington Beach dental office takes only about an hour. After you have comfortably passed your teeth whitening appointment while watching a movie in one of our operatories, you can leave with a beautiful, rejuvenated smile. In addition to being powerful, in-office teeth whitening is also convenient. Many patients try the mess and hassle of over-the-counter whitening strips or bleaching trays to achieve a whiter smile, without ever seeing the results they’re looking for. This investment in drug store teeth whitening can leave you drained of time and money in your search for a solution that will lift deep stains on teeth enamel. There are hundreds of whitening treatments available in the marketplace, but many take-home gels and strips are ineffective and may not elicit the desired results, especially for patients whose teeth are severely stained and discolored. With in-office whitening treatment, all of your teeth are treated simultaneously – not just the teeth in your smile line, like over-the-counter treatments target. There is no drug store teeth whitening product that can match a cosmetic dentist's ability to provide powerful results in such a short window of time. Are you ready for a whiter smile? Contact Pearly White Dental to learn more about Huntington Beach teeth whitening from Dr. Titi Dang.